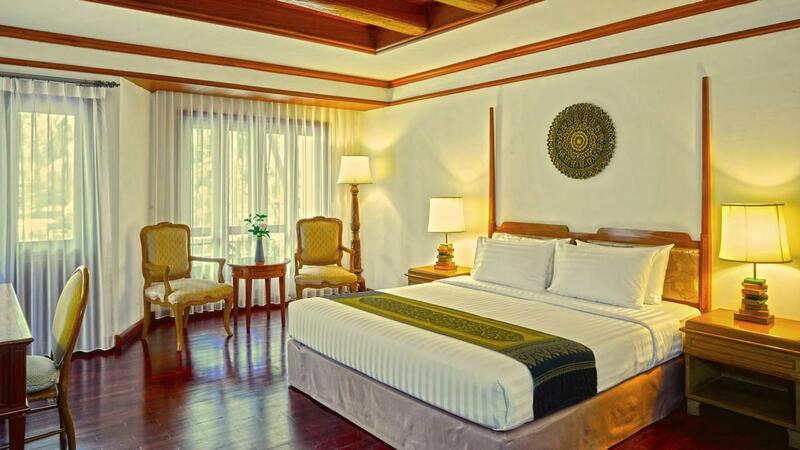 "The resort is ideally situated on a bend in the river making..."
Have a question for Felix River Kwai Resort? "Large rooms, good work staff." "Always impressed by the service, grounds and location." 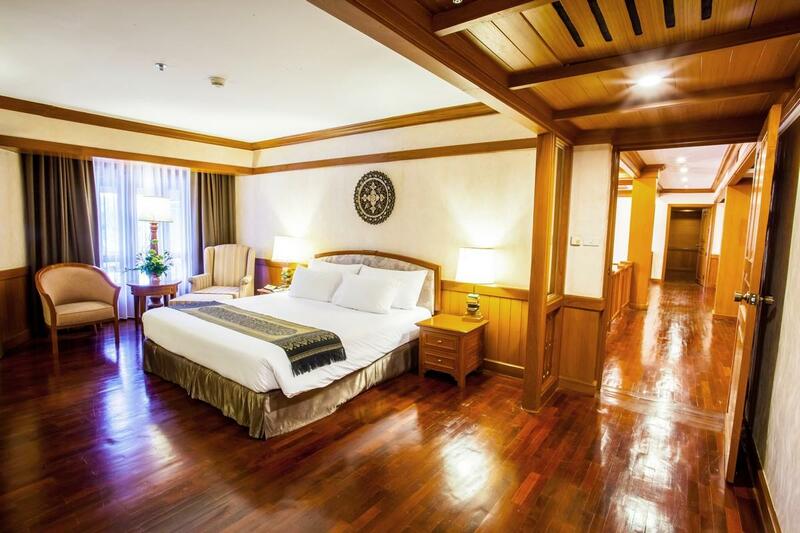 The 255-room, low-rise hotel ideally stands along the banks of the famous River Kwai. 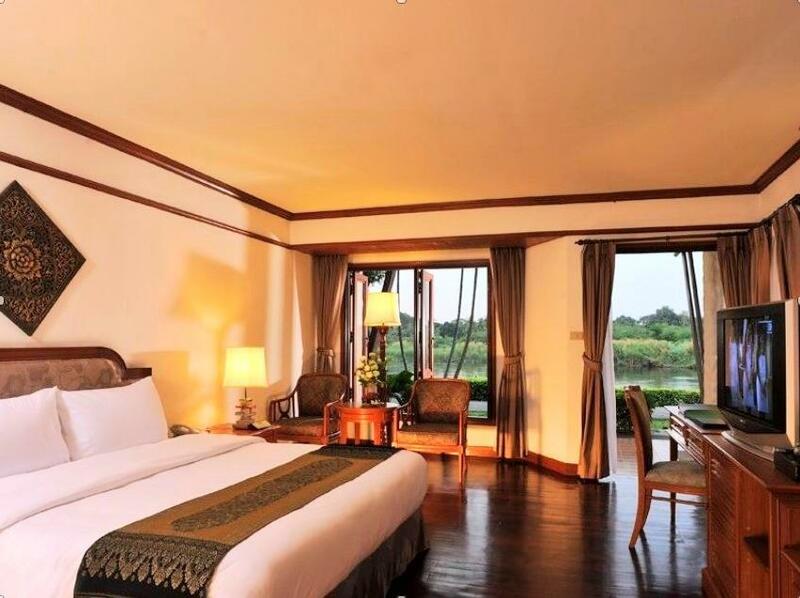 Nestled amongst beautifully landscaped gardens, Felix River Kwai Resort is just a two-hour drive from the city of Bangkok and five minutes away from the Don-rak Railway Station. To venture to Kanchanaburi, guests can walk along the famous Bridge on the River Kwai, which is just 200 meters away from the hotel. Guests also have many drinking and dining options to choose from, serving Dim Sum, Thai and Chinese specialties. To make your reservation at the Felix River Kwai Resort, please use our secure online booking form. "Good old hotel, big rooms with green view seen from each win..."
The large resort is a bit older then the more modern ones on the opposite side of the river. Nice swimming pool in a garden setting. Although it takes a longer drive by car, you can reach (and cross) the railway bridge in less than 5 minutes, or there is a boat shuttle service until 6pm. Downside of the room was that there were the many mosquitos. Breakfast has a good choice of Western and Asian food. The resort is ideally situated on a bend in the river making full use of the area with a lovely pool and spectacular gardens. Our spacious and clean room had a partial river view from the balcony. A kettle and fridge are provided. The rooms are a little dated- one extra power point to recharge phones which we had to crawl under the desk to access, the lighting was rather dim. All in all rooms could do with an upgrade. WiFi free but we had to keep logging back in. The hot water supply was also somewhat hit and miss, not what one expects of a top resort. Reasonably good value, if a little pricey for Thailand, breakfast was expensive so we only ate there once. Staff were excellent, helpful and pleasant as one comes to take for granted in Thailand, but always a bonus and much appreciated. A great place to unwind after busy days sightseeing in this lovely and scenic part of Thailand. So I would recommend bearing the above points in mind. Good hotel and friendly staff. Adjacent to the bridge on the river Kwai. Will Recommend this resort to all. We really enjoyed our stay in this resort, where everything was of great quality. The staff were very friendly, the prices reasonable, the layout magical. It was super to be able to walk into town over the famous bridge. I would definitely stay here again. The only negative aspect was that the waiters and wiatresses had quite limited English. Our stay was ok. Def had some good points. Rooms large and clean. Nice Pools. Staff was ready to help when needed. But they did have to fix the hot water and internet. Breakfast was reasonable, not just bread and eggs. Should have your own transport or rent a scooter from town. The place could use a proper revamp but overall ok. The room was clean and large and the bed was ok. Had a reasonable bath in the tub. Stayed in 2 rooms, one had good internet, the other was off and on. The swimming pools were as advertised, both were big and clean. The grounds are large and fairly well maintained. The staff was nice and accommodating. The breakfast selection was ok. We rented a scooter from town and getting around was easy enough. Nothing too much to rave or rant about. 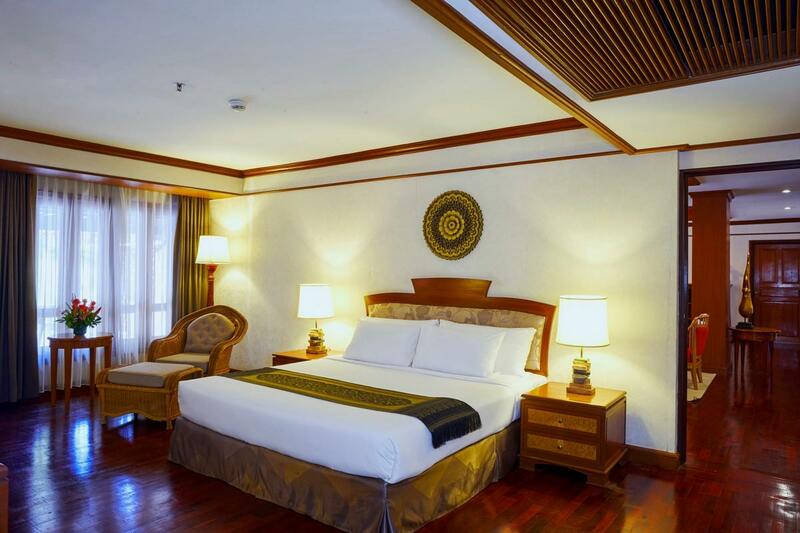 Pros... Fast check in.. good breakfast spread, fast room service, great spa, close to the River Kwai bridge but peaceful surroundings, large room. Safe. Good water pressure in the shower. Tasty food. Large property grounds Cons... Telephone line between the rooms and other facilities were down but that got sorted out really quick..(note... the next day with no guarantee that they would work). Noisy neighbors from a block behind me. But I would still stay at the same place should I return to Kanchanaburi. Would stay longer than just two nights... I recommend 4 nights minimum would be good. Great for families too. We were very happy with the hotel. Although the rooms are a bit dated, everything is there, and very clean. The rooms were large enough, and the balcony overlooking the garden with the river in the distance was lovely. (We booked a "GardenView" room.) Breakfast was adequate, and otherwise, we ate outside so cannot comment on the food. A very large bathroom, but no separate shower. The grounds are amazing. One could spend days just enjoying the gardens and the riverside. There are tennis courts, a couple of beautiful swimming pools, lots of facilities. Note: this hotel is vast. Loved staying here. The waterfront view from the balcony was perfect for coffee in the morning and a drink in the evening. The staff were polite and very helpful. Quiet location, across the river from the market and some excellent restaurants. I would definitely recommend this resort to anyone. Friendly staff, good location that is both close to town but across the river from the crowds. Excellent accommodations for the money. The buildings are older but clean and serviceable. Nice pool and grounds. Food was just okay, but there is always somewhere else to eat in Thailand. We were pleased with this hotel. We had our three kids ages from 3-7 and they loved the pool because it has a separate section for younger kids. It has two pools, but we enjoyed the pool area for the kids. The breakfast was average and serves local and western items - a little of everything. Their breakfast staff was very nice to pack left over breakfast for the kids since they just played/ran around the grounds when we ate outside. We booked two rooms but after seeing the two beds provided, they are bigger than twins size, and we could of put them together and just ordered an extra bed to fit all of us in one room. The rooms are nice and spacious. The hotel water streams around the hotel resort look great but do need some cleaning. Overall, we had a nice 3 day stay and its a perfect location to walk over to the bridge and JEATH museum. 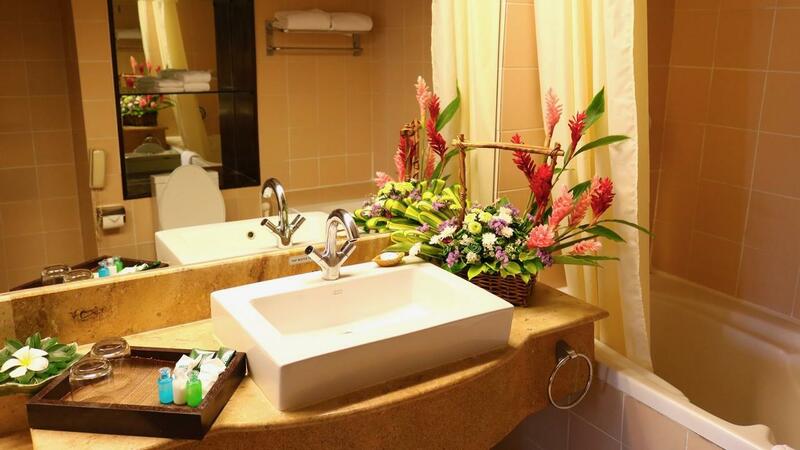 Some areas of the hotel and bathrooms in the rooms do need a facelift but nothing major to keep you from staying at this hotel. Plenty of resort grounds to keep the children running around. We would stay here again. Nice hotel and soothing pool Stayed in the river view room .....very nice The bridge only a 15 minute walk Downside was the old price then ++ on food and drink Meaning they show you the price then add on government and service tax when you pay. I have not seen this since Bali. Should just do what every other Thai hotel I have stayed in has done and that is include the taxes on the price and be up front about it. That said I would stay again. 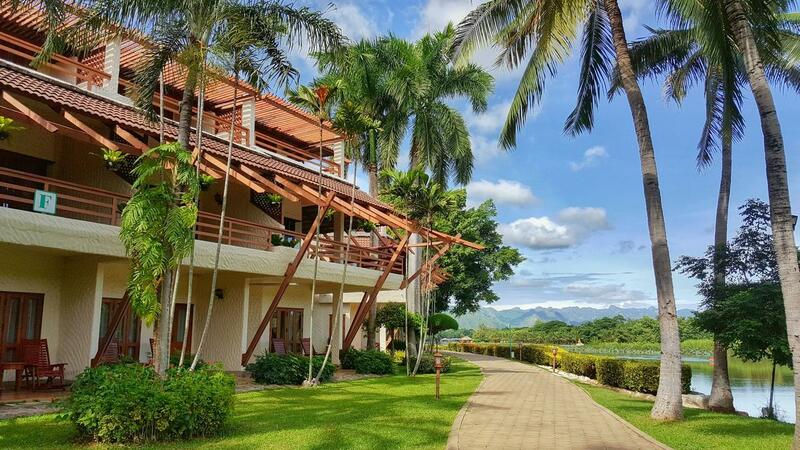 Large resort, that seems deceptively quiet, set in beautiful grounds along the river bank. Nature is all around, with a serene ambience to relax away the days in. 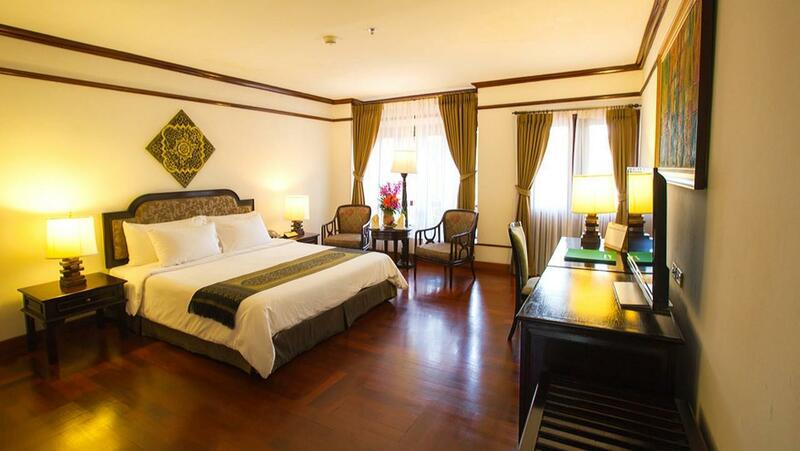 Located walking distance from the famous bridge, everything is set for a fabulous stay. I didn't try the restaurants, so no comment on the food options. Two large swimming pools stand out here, one specifically for swimmers. Bicycles are available for rent (though most other hotels proivde these as a complimentart service); however, they can only be used within the grounds of the hotel, which makes rental quite pointless. Sort the bikes out! Pros - spacious, amazing pool, comfortable bed, crisp white sheets, fantastic and accomodating staff members, BEAUTIFUL grounds, the river and bridge so close and yummy breakfast! Cons - if I had to pick one! a little way out from downtown which buzzes with restaurant and night life. Nothing a cheap tuk tuk doesn't fix! We really enjoyed our stay and totally recommend it! Thank you Felix Resort for a memorable stay.